The global market for information and communications technology (ICT) is expected to grow by 1.9 percent to 2.3 trillion euros in 2010. The global market for information and communications technology (ICT) is expected to grow by 1.9 percent to 2.3 trillion euros in 2010. This according to the European Information Technology Observatory (EITO), an international market research firm. In the crisis year of 2009, sales fell by as much as 1.6 percent. �The global high-tech markets are recovering appreciably from the economic crisis. Signs are once again pointing toward growth,� said Prof. August-Wilhelm Scheer, president of the German EITO partner association BITKOM, while presenting the data at CeBIT in Hanover. �In the industrial countries, increasingly companies are investing again in modern IT systems." The drivers of growth are the emerging countries of China, India and Brazil, whose high-tech markets have been able to make strong gains in spite of the crisis. �In 2010, the emerging countries will provide additional impetus to the markets,� said Scheer. 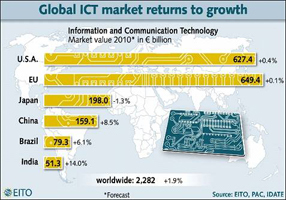 If the economic recovery continues, the global ICT market will grow by 3.7 percent to 2.4 trillion euros in 2011, according to EITO. The economic crisis had only a slight impact on the global telecommunications market. After a slight dip of 0.5 percent last year, 2010 sales will grow by 2.9 percent to 1.4 trillion euros, according to EITO�s forecast. �The telecommunications market is marked by technological and structural changes,� Scheer stated. As a result, people are making fewer phone calls on the fixed network and, instead, are using mobile phones or Internet telephony more often. In the meantime, 18 percent of all households in the U.S. no longer use the fixed network, preferring to use their mobile phones exclusively. In Japan, it is 20 percent and in Italy it is even 26 percent of households. Accordingly, sales of fixed network voice services have been declining for years. In 2010, they will fall worldwide by 4.6 percent. On the other hand, the mobile market is growing slightly, up 1.4 percent to 417 billion euros. The strongest growth is posted by data services, both fixed network as well as mobile. Sales of Internet connections and data services on a fixed network will grow in 2010 by 7 percent to 198 billion euros, according to EITO data. Mobile data services are posting even stronger growth: up 16 percent to 141.5 billion euros. �Mobile Internet is conquering the mass market,� said Scheer. According to the EITO forecast, sales in information technology (IT hardware, software and IT services) will rise by 0.4 percent to 894 billion euros in 2010. In 2009, they fell by 4.6 percent due to the crisis. �The crucial thing is that in industrialised countries investments in new IT systems by companies are accelerating again,� stated Scheer. Energy providers, financial management companies and the public sector are expected to spend more on IT. �Providers of software and IT services are benefiting the most from the recovery,� according to Scheer. Sales in those segments are growing by 1 percent to 625 billion euros (previous year: minus 2.7 percent). An important market driver is Cloud Computing, which is growing in the EU at rates of 20 percent per year. Scheer: �The principle of using software applications and computer performance as needed will become widely established.� In 2011, the global IT market, according to EITO, will see growth again, gaining 4 percent. With the exception of Russia, the so-called BRIC countries (Brazil, Russia, India and China) were hit less severely by the global economic and financial crisis and are posting the strongest growth. After posting 10 percent last year, the Chinese IT market will gain 11 percent, up to 33.6 billion euros, in 2010. In India, IT sales will also grow by 11 percent, to 14 billion euros. �Granted, the penetration of the economy and public administration with modern IT systems is not yet so far advanced as in the industrial countries, but the BRIC countries are quickly catching up,� said Scheer. By comparison: In the EU, the market will grow in 2010 by only 0.2 percent, to 303 billion euros. In the U.S., sales in IT hardware, software and IT services will drop slightly in 2010, down 0.8 percent to 304 billion euros. A similar picture emerges in the telecommunications market. The growth markets are in the BRIC countries. In 2010, the Chinese telecom market will grow by 8 percent to 126 billion euros, while the Indian market will grow by 15 percent to 40.5 billion euros. In India only a third of the population uses a mobile phone; in China, about half. In Germany for example, it is roughly 80 percent. Powered by the success of smartphones and mobile Internet services, the telecom market in the U.S. will grow by 1.6 percent to 324 billion euros. In the EU, the plus is only 0.1 percent to 346 billion euros.